Pomegranates are considered to be a superfood, and have been considered a treasure among fruits for centuries. In ancient times, the people of Babylon would chew pomegranate seeds before heading into battles as they believed that it would make them invincible. Pomegranates from Kandahar in Afghanistan are supposed to be of the finest variety. Pomegranates get their name from the Latin language, the original term meaning ‘seeded apple’. The seeds of the pomegranate are the edible part of the fruit, embedded inside the skin in a whitish part. On an average, there are around 600 seeds in a pomegranate, also known as arils. 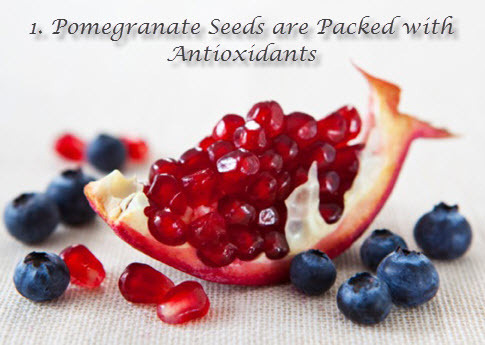 Pomegranate seeds are juicy and rich in vitamins, fiber and phytochemicals. Phytochemicals are non-nutritive chemicals that help fight diseases, promote heart health. Furthermore, the seeds are low in calories. Thus, this makes the pomegranate a very healthy choice of fruit. 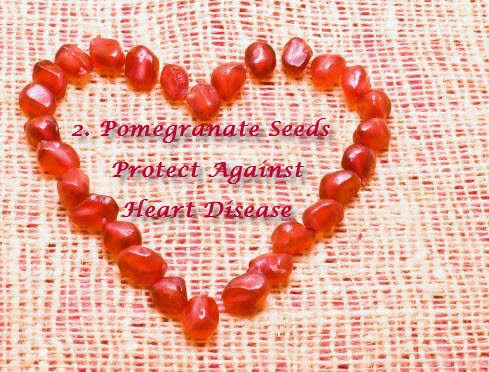 There are a multitude of benefits of pomegranate seeds. These benefits may have been known to people from various cultures before us, and researches in recent times have started showing results that point to the goodness of this wonder fruit. Pomegranate seeds are known to be filled with compounds rich in anti-oxidants, their amount exceeding the quantity of anti-oxidants found in red wine, green tea, blueberry and cranberry juices. These antioxidants help prevent diseases, as they help fight against free radicals which can possibly cause cellular damage and harm the DNA too. 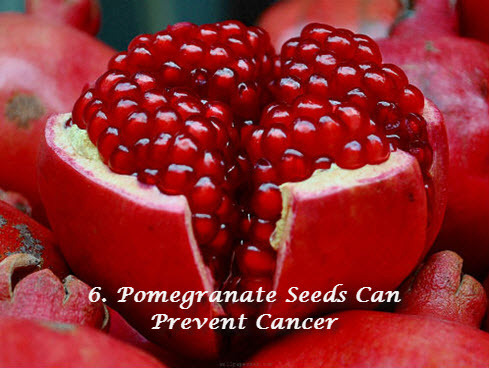 By fighting the free radicals pomegranate may as well prevent cancer or at least slow down the progress. Pomegranate seeds are a nutrient dense food source, rich in phytochemicals together with flavonoids and polyphenols, which combined together, prove to be a major disease fighting component. These compounds help lower cholesterol and high blood pressure which, in turn, decreases the risk of strokes and heart attacks. They increase the speed at which the blockages melt away from the heart. Therefore, they provide protection against heart disease. 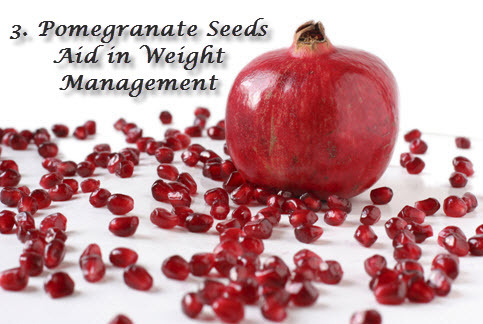 As the seeds of the pomegranate are rich in fiber and low in calories, it makes for a good food choice for someone looking to lose weight and also helps in maintaining healthy weight at the same time. Almost 40 percent of the suggested daily value (DV) of Vitamin C can be found in a serving of 100g of pomegranate seeds, which will amount to 10.2mg. Vitamin C helps build up the immune system, aids in quick healing up of wounds and enhances iron absorption in the body. Vitamin K is required by the human body to facilitate proper blood clotting and to maintain strong, healthy bones. 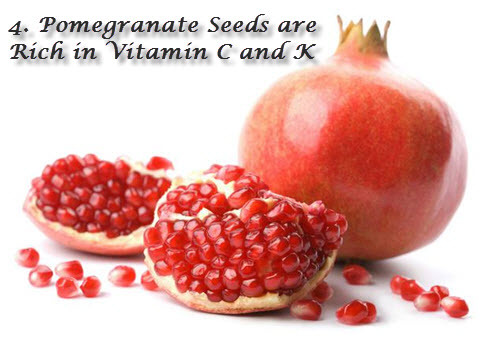 In 100g of pomegranate seeds there are about 16mcg of Vitamin K which adds up to 20 percent of the DV. 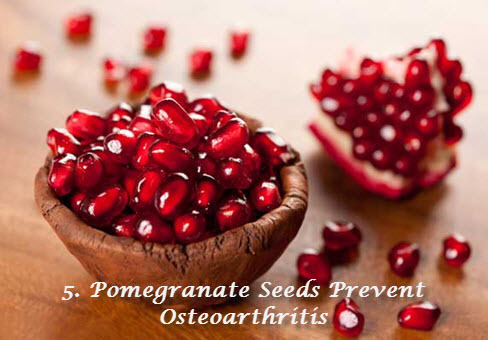 A study conducted in the year 2005, showed that a certain enzyme present in pomegranate seeds might aid in slowing down the deterioration of the cartilage that leads to osteoarthritis. Pomegranate is also known to possess anti-inflammatory properties, which helps in treating this condition even after it is ongoing. Studies have shown that pomegranate seeds consist of hormonal combinations that could assist in the treatment and prevention of breast cancer. At the same time, pomegranates possess estrogenic qualities that enable the replacement of estrogen required in postmenopausal women to ward off heart disease and osteoporosis, and are also capable of selectively destroying cancer cells that are selectively dependent on estrogen. Pomegranates can be good protectors against sunburn. 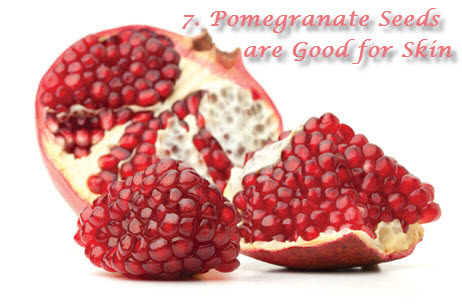 A study showed that consuming the fruit protected the subjects from sunburn, improved the complexion and thus, increased one’s ability to stay in the sun long enough to absorb sufficient amounts of Vitamin D.
Iron is a major component of the blood and to increase the hemoglobin in the blood stream all you have do is eat pomegranate seeds. A healthy amount of iron will enable the blood to carry more oxygen which will provide more energy and help the different body parts in functioning properly. 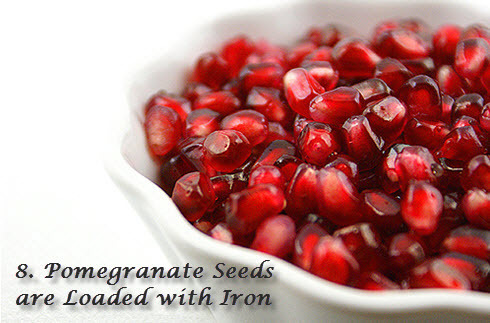 A medium serving of pomegranate seeds can contain up to 2 percent of the DV of iron. Iron deficiency is the leading cause of anemia, among other things. There are many more known benefits of pomegranate seeds, like it aids in the digestive process, acts as an anti-aging instrument, an appetite stimulant and anti-inflammatory agent. Although studies and research are still in progress to find out more about the goodness of this hexagon shaped fruit, the benefits of this fruit on the overall health is what is making it gain popularity at a rapidly growing pace.